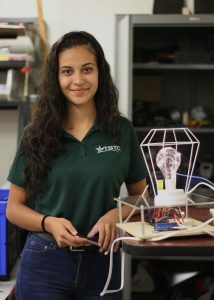 (HARLINGEN) – Joesaline M. Orta is one of two women studying Mechatronics Technology at Texas State Technical College. The Brownsville native rises to the occasion with an outstanding grade-point average of 3.7 and plans to graduate with her associate degree in Spring 2019. I am looking forward to working for three to five years after graduation. I’m aiming to end up in the Houston or San Antonio area. Ideally, I’m interested in working for a company like Toyota or Tenaris in the manufacturing department. Eventually, I would like to come back to study Mechanical Engineering at the University of Texas Rio Grande Valley. I aspire to open a business where I can apply my knowledge in mechatronics. I have an idea of what this business would look like: it would be a one-stop shop where manufacturers are able to purchase parts usually only available online, immediately. It would be a quicker, more efficient way to shop. 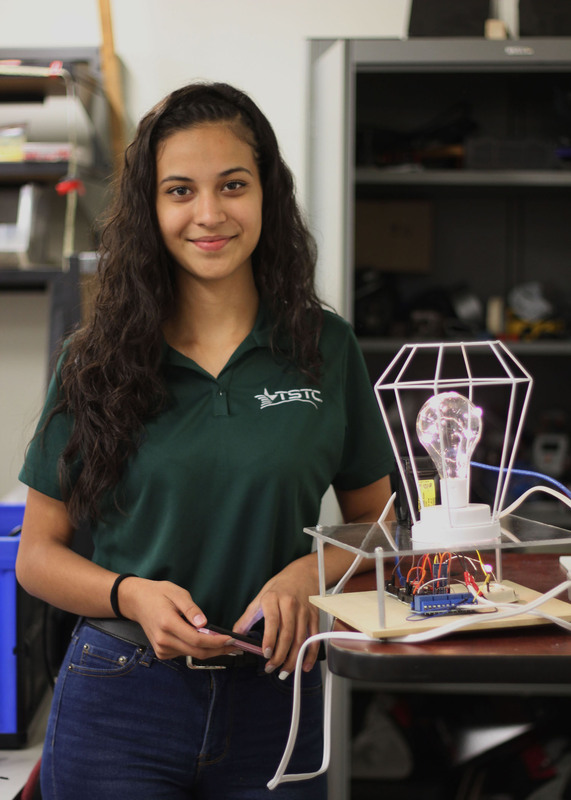 My greatest accomplishment is obtaining my position as a work study where I am able to attend recruitment events where we reach out to high school students to spark their interest in mechatronics. It is important to reach out not only to high schools, but undecided students here at TSTC. I represent only one of two women in the program, so it is important to spread awareness. I have learned to never give up. I know that I have the capability to do something, even when it is challenging. In mechatronics, you often have to troubleshoot when your project isn’t functioning in the desired way. Repeating this process over and over becomes frustrating, but pushing through and finding the solution is the most rewarding part of the process. Name a TSTC person who most influences your success. The instructors at TSTC encourage me immensely. Mechatronics Technology Lab Assistant Adalberto Perez, in particular, helped me when I didn’t believe in my own abilities. He helped me find solutions and motivated me to push myself. My advice to future TSTC students is to not procrastinate, accept help from your instructors, because they will always make themselves available to you, and most importantly, always believe in yourself and your abilities.